The HOLLAND CLUB is named after John Philip Holland, engineer and designer of the first U.S. Navy submarine. The United States submarine force came into existence October 12, 1900, with the commissioning of USS Holland (SS-1), although the birthday is celebrated April 11, the date the U.S. Navy acquired USS Holland. There are no ex-submariners. Submarine qualification passes a man into a mystic brotherhood of undersea warriors, and it marks him forever as one of a special breed. Although they no longer sail beneath the seas, they still wear their ‘dolphins’ with honor and pride. These Holland Club shipmates and those who have gone before served our Nation extremely well. They have justly earned the honor and respect we show them when they are inducted into the Holland Club. We, indeed, are honored by their presence, and all submariners should look forward with anticipation to the day when they too may qualify for membership in this special group. Our web page "The Submariner" is also applicable in this regard. The national membership voted on and adopted this change in 2010. With the adoption of this change, new Holland Club members (i.e., those members who are inducted after September 4, 2010), will continue to pay their annual national dues, unless they are also National Life Members. Beginning with Kenn McDermott's administration, USS Virginia Base members who qualify for induction into the Holland Club now receive gifts - not only from USSVI, but also from USS Virginia Base, at a formal induction ceremony to honor their significant achievement and service. 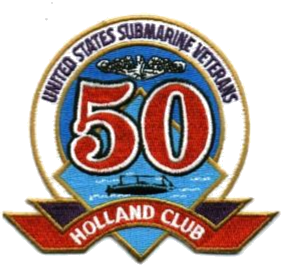 This web page is dedicated to our USS Virginia Base Holland Club members and lists each current member and their Qual Boat and Qual Date, along with any photos that may be available from their induction ceremonies, in the table below. NOTE: If a members name is highlighted with a link, then clicking on their name will take you to photos taken at the member's Holland Club induction. Those members whose names are not linked may contribute photos to Kenn from their induction ceremony if they are available. Also please note that finding these photos and posting them here is a 'work in progress' which may take some time. Clicking on a link takes you to that members Holland Club Induction slide show photos (if available). Click on the side arrows to step through the photos, and after you click (or swipe) move your cursor away from the photos and you'll see the captions. More photos will be added as the Webmaster locates and resizes them for the web.